Shenzhen Graduate School, Harbin Institute of Technology, Shenzhen, China. Received November 15th, 2010; revised December 18th, 2010; accepted December 24th, 2010.
termining the key country or region with which to prior carry out international science and technology cooperation. level and resources of Guangdong province. tiveness and facilitate economic growth as well. been made based on those researches above. tion, become the urgent subjects to be studied. source matches the requirement of specific project. 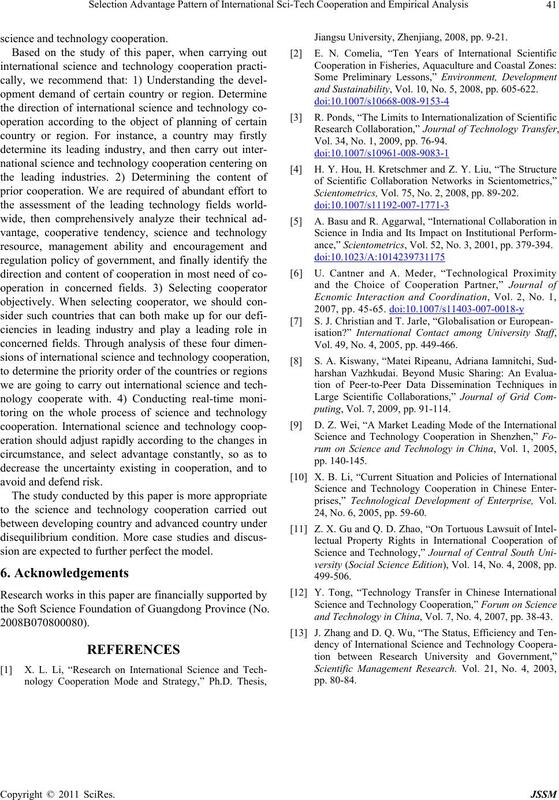 out international science and technology cooperation. international science and technology cooperation. with emphasis by international organization. tribute to the operability of cooperation. science and technolog y cooperation. concerned and the av ailability of technology or product. 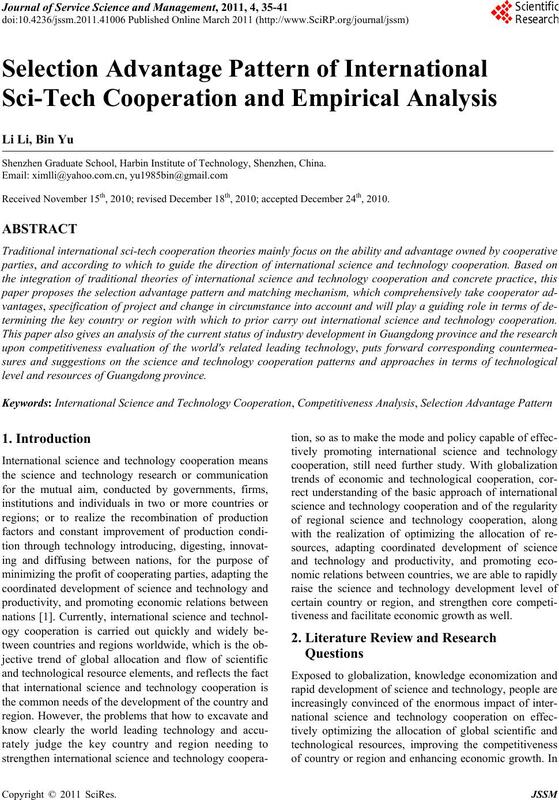 Figure 1. International science and technology cooperation selection advantage and matching mechanism. Guangdong Province to continue rapid development. priority in different countries or regions of each area. prioritized and the techno logy availability. Table 1. Industry added value as a share of GDP in Guangdong pr ovince. Source: Gua ngdong Statistic Y earbook; China High-tech Industries Statistic Yearbook; Database of Zhonghong Industry. Table 2. 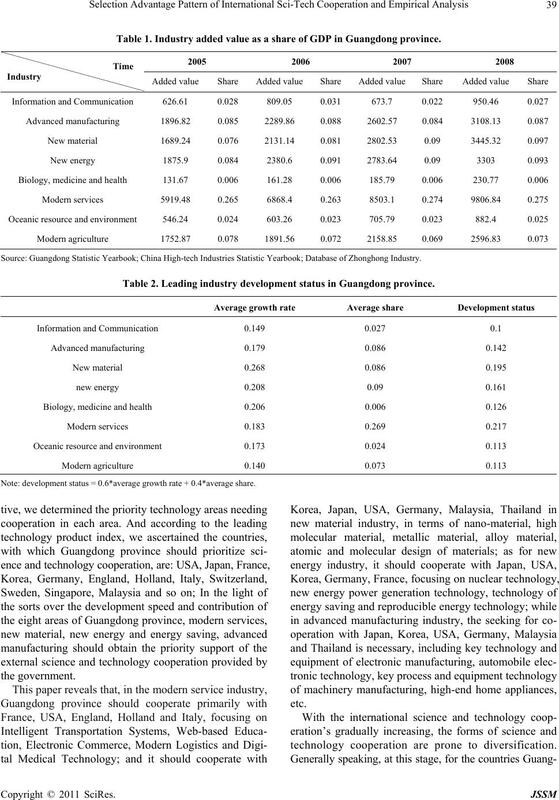 Leading industry development status in Guangdong provinc e.
Note: development status = 0.6*average growth rate + 0.4*average share. 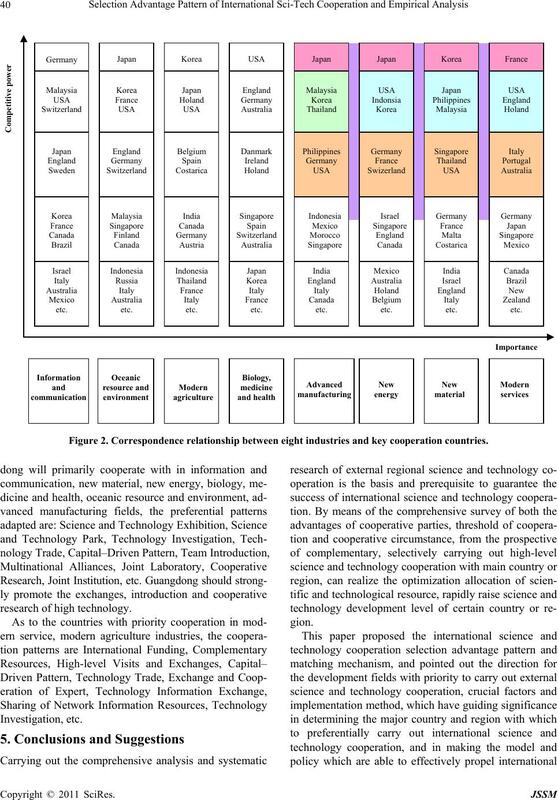 technology cooperation are prone to diversification. Figure 2. Correspondence re lationship be tween eight industries and key c ooperation countr ies. sion are expected to further perfect the model. the Soft Science Foundation of Guangdong Province (No. Jiangsu University, Zhenjiang, 2008, pp. 9-21.
and Sustainability, Vol. 10, No. 5, 2008, pp. 605-622. Vol. 34, No. 1, 2009, pp. 76-94. Scientometrics, Vol. 75, No. 2, 2008, pp. 89-202.
ance,” Scientometrics, Vol. 52, No. 3, 2001, pp. 379-394. Vol. 49, No. 4, 2005, pp. 449-466.
puting, Vol. 7, 2009, pp. 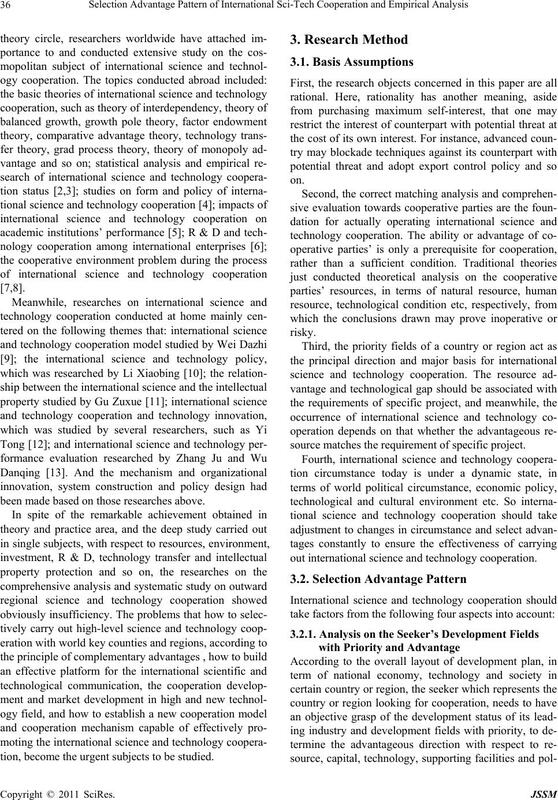 91-114.
prises,” Technological Development of Enterprise, Vol. 24, No. 6, 2005, pp. 59-60.
versity (Social Science Edition), Vol. 14, No. 4, 2008, pp. and Technology in China, Vol. 7, No. 4, 2007, pp. 38-43.